No garage is complete without a lift. Lifting equipment, however, can be quite pricey ranging anywhere from four-thousand US dollars to upwards of fifty-thousand. There are alternatives to full scissor or four-point lifts. 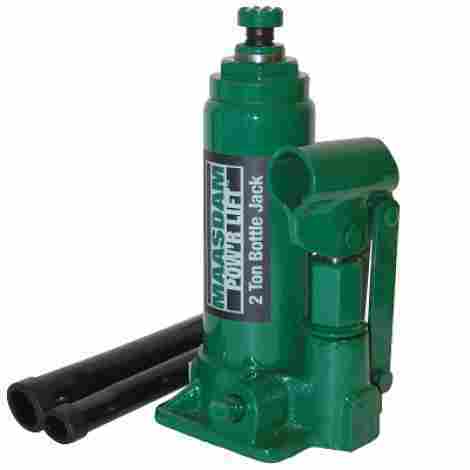 Bottle jacks, a type of hydraulic jack, are not only an inexpensive alternative but also a strong and more compact option. These are often quite small and can be as small as three and a half inches in height. Their short stature makes them a great addition to any small home garage. They just don’t take up a lot a space. Despite their size, this equipment tends to be quite strong. Some options can lift up to fifty tons or about one hundred thousand pounds of weight. They are also not always used to just lift vehicles, but can also be used to lift projects as heavy as small cabins. Because their lifting capacity can cover such a wide range, you may notice that the price point for this equipment will also vary greatly. We have seen options starting as low as $15 up to $150. Even the most expensive options on the market do not get anywhere close to the industrial alternatives, however. In this article, we run through the top-rated options on the market and their benefits. Before we get to the top ten list, let’s talk about what exactly a this product is. 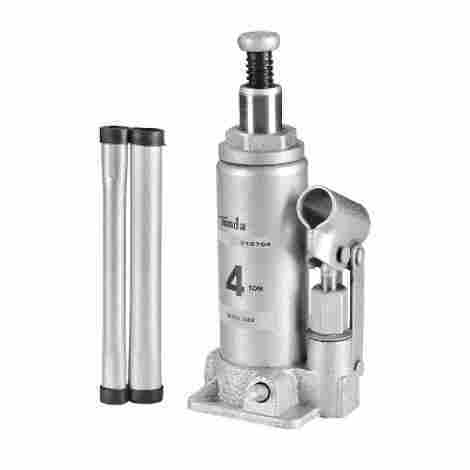 They are a type of a hydraulic jack that is meant to lift heavy loads temporarily. They use liquid pressure to lift loads placed on them. The liquid is usually oil because oil is more stable and lubricating. Typically they are used to lift vehicles for maintenance and to lift housing structures for temporary access. They have become increasingly more common over the last few years during search and rescue missions after the devastating earthquakes we have been having. Now that we have a basic idea of what this product is and what it is typically used for, let’s get into the top ten products we found in 2018. This bottle jack is designed for more of a commercial use. Its air pump run very quickly for reducing lift time and is made of a hard alloy for durability. It has a maximum lifting capacity of 24,000 pounds and can lift up to 19 13/16 inch. It comes in two different sizes, 12 ton and 20 ton, and operates on a 120-200 PSI. This pump can be used on its own or with an air compressor (handy for when the operator does not have an air compressor on hand). 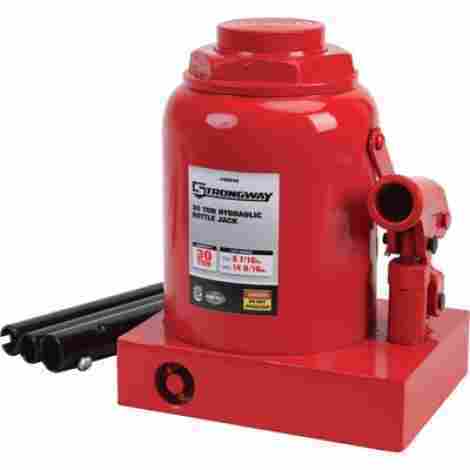 This hydraulic jack has a 4-foot air hose, good for larger vehicles like buses or trucks. This bottle jacks price is mid-range. It is inexpensive considering it can be used without an air compressor and thus eliminating the need to buy one. This product is both a jack stand and a lift in one. It has safety bar locks at customizable heights and has a wide steel base for better stability. No more need for jackstands. It safely lifts and holds body-on-frame sedans, CUV's and SUV's. Alltrade is known to have high standards of safety standards. They either meet or exceed the applicable standards set by the US Government and American National Standards Institute. This product is on the lower end in cost. It has numerous positive reviews and eliminates the need for stands and is therefore a good bang for your buck. This option has a 2 ton capacity and has a 5-15/16 inch to 14-1/2 inch lift range. It has a dual hydraulic cylinder that can lift higher weight capacities on smaller footprints. It is well-constructed and built for durability. 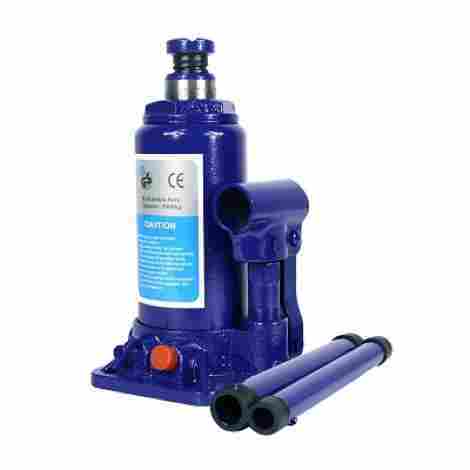 This pump has a resistant surface for easy clean up of the unit. It has a round and clean shape making it easier to wipe around as well. 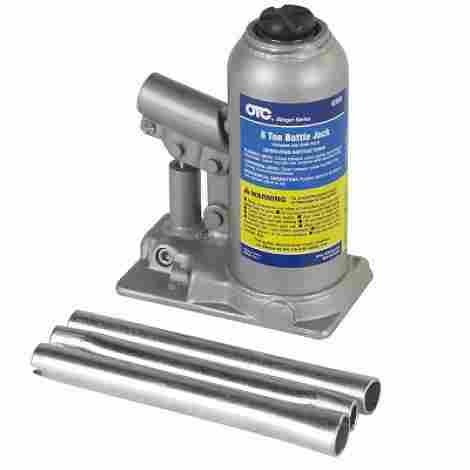 Only standing 5-15/16 inches in height, this pump is better for lower vehicles. 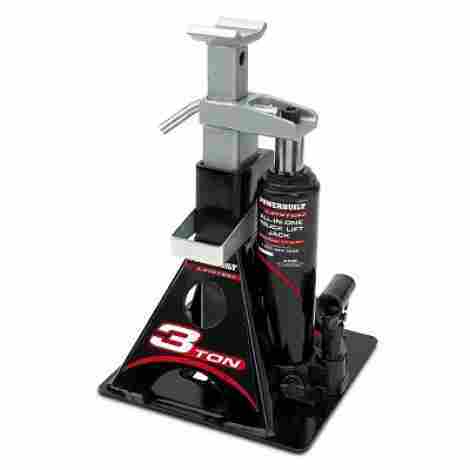 This unit is on the lower end of the price range in regards to bottle pumps. The reasoning behind this is because it's meant for smaller vehicles. This one is ideal for anyone looking for a pump who has a smaller vehicle, it is definitely worth the price for those situations. This product lifts up to 2 tons, which amounts to 4000 pounds, and is green in color. It has a lifting range of 7 1/8 inch to 13 9/16 inch. This lift is very inexpensive but doesn't compromise on quality. This option would be ideal for users who are looking for a lift for a just-in-case emergency situations. It is very small and easy to store. It has very little bulk. This is one of its strong qualities. This option is the most inexpensive on our list. This product could be considered "cheap", but the quality is there. It has held up to tests, it is small and inexpensive. This one is the winner in cost. This product is sleek and silver in color. It lifts up to 12 tons (24000 pounds) and can lift up to 14.8 inches. This lift is very compact and has a very smooth operation. This product has a stronger capacity than the majority of the other options in this article. It comes in 2 ton, 4 ton, 6 ton and 12-ton strengths. It has critical stress points that are reinforced as well for added durability and dependability. This product can lift up to 14.8 inches high, great for larger vehicles. This product ranges in price due to the different sizes available for the product. It is on the lower end in price and considering the positive reviews is worth the cost. It is small and compact, it lifts up to 12 tons and is inexpensive. This option on our top ten list is little and strong. It has a lift range of 6-1/2 inches to 11-1/4 inches. It can lift up to a whopping 20 tons (40,000 pounds) of weight. It stands at 6-1/2 inches tall. This lift is one of the strongest of all of the options in this article. It is meant for fairly large vehicles. This particular lift can be used on its side if needed. Because it can lift such heavy weights, it can be used to even hoist up structures if secured correctly. This product sits in the middle range in price and for good reason, it can literally lift cabins. This option is a little high for average sized vehicles and probably better reserved for bigger jobs. Many reviewers use it for lifting cabins and decks. It has very little negative reviews and quite a few good ones. This is your best bet for bigger jobs especially considering the price. This option is available in 2-ton, 3-ton, 5-ton, 8-ton, 12-ton, 20-ton and 50-ton weight capacities. It comes with a 2 year limited warranty and includes a free seal kit (to help extend the lift's life). It has a 4-1/2 inch stroke, a minimum height of 7-1/2 inch height and a maximum 14-9/16 inch height. For additional rust resistance, this product is also small and sleek. The company provides a free seal kit for extended product life. These pumps sit right in the middle of the price range. They are rated high and have several load options. With minimal negative reviews this pump is definitely worth the price. This option can lift up to 4 tons (8000 pounds). It has a lifting range of 8 inches to 15-3/8 inches. It has a 90-day warranty from date of purchase. It is red in color and, is small and compact. The bypass susytem protects against ram over travel. The heat treated stress areas ensures a long life and better overall performance. This product is in the middle range in price range. It has a 90 day warranty and is durable and heat resistant. This product comes in both 3-ton and 5-ton models (6000 and 10,000 pounds). It comes with overload protection, has a minimum height of 7-1/4 inches and a maximum height of 14-3/8 inches. It also comes with an extension screw that is 2-1/2 inches in height. This product is backed by the full one-year warranty from the date of the purchase. This lift has an safety value meant for protection in case of too heavy of a load. Finally, it has a bigger base that can hold a load safely for longer periods of time. The hydraulic cylinder build helps the lift to run better on low oil pressure to raise the item lifted and thus decrease wear and tear, and extends the overall life of the product. This product is reasonably priced- coming in at the middle of the price range of the top-rated options listed in this article. Its major advantage is the safety features as well as the added features to extend its life. This product can lift a whopping 20-ton (40,000 pounds) load. It has a lifting range of 6-5/8 inches to 10-15/16 inches. 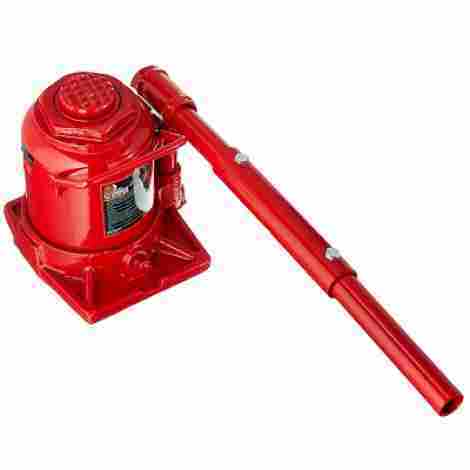 It is red in color and comes with an extension screw for an even higher lift-range. The wide base provides stability and strength. The saddle provides generous lifting area and a secure grip on the product. This unit is also mid-range in price. It is one of the strongest of all the lifts in this article and highly rated. The price value is in its power. In conclusion, this piece of equipment can be a helpful addition to any garage or vehicle. They are handy as a mechanism for working on vehicles but also in a crisis, like on the side of the road with a flat tire. They are small enough that they can be stored in vehicle organizers without taking up highly coveted vehicle space. They can even be used for bigger projects, such as hoisting structures like houses and vehicles too. They are also a massive improvement technology-wise compared to the manual options already in vehicles. We hope that this handy guide here on Motoful.com has not only helped you learn a little bit more about these handy devices, but that we have helped you to decide what option best suits your needs. An important thing to consider when purchasing one of these products is the lifting range required to hoist the object you are about to lift. First of all, the jack needs to be able to fit under the object. It’s important to measure the range between the floor and the item you are lifting to ensure that it can physically fit in a non-extended position under the vehicle. The other item to consider is how high or wide the space between the ground (or supporting surface) and the lifted object needs to be. Each product has a specified maximum range. This will help narrow down the product options and avoid any need for returns. There is a considerable weight difference between a Civic and a bungalow. Weight usually tends to be the price indicator on many lifts. The more weight you need to lift, the more expensive the product you will need to lift it will be. There is no point buying far more than what you need. It’s important to find out the weight of the item you’re lifting before investing. It’s hard to know how much a home weighs. If you are looking at newer homes, most have a concrete foundation and a concrete foundation is going to weigh considerably more than older houses without the concrete foundation. An average house can weigh between 80,000 to 160,000 pounds. It would be wise to do research on your home based on its specifications. A vehicle’s weight, on the other hand, is much easier to figure out. A vehicle will either have their weights on the engine, in the door panel or in the owner’s manual. Once the weight is known, ensure that you are buying a product that will support more than the max weight, just to be safe. This will help narrow down which product is appropriate for your job. You obviously don’t want to physically put yourself under a vehicle when you know that the only thing stopping the vehicle from falling on you is made with cheap or weak materials. Look at the specifications of each of the products you’re considering to ensure that it is made of sturdy material like steel and aluminum rather than rubber or cast. Reviewing the manufacturer’s reputation is also a good idea. 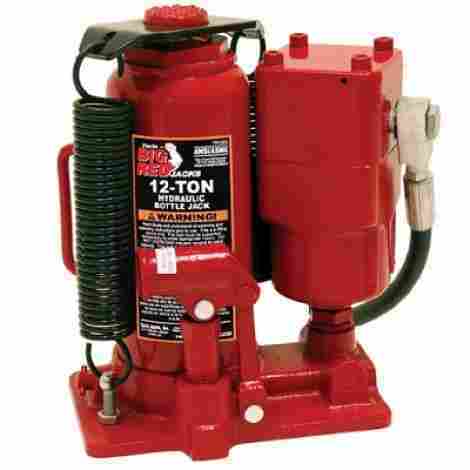 There are numerous hydraulic jack manufacturers on the market today so it’s a good idea to read up about the company and any issues or recalls they’ve had in the past. A good idea is if you are reading consumer reviews to run it through a review checker (there are several available) to ensure they are real reviews. Another thing to consider is how long the company has been in business. Time in the industry means experience and experience usually yields better, more innovational and more reliable products. Price is not always the best thing to consider when purchasing lifting equipment as the phrase “you get what you pay for” exists for a reason, however it’s important that you’re not buying something way overpriced. We compared several options within a similar price range as well as the same quality rating in this article so it should give you a good idea of where the product should sit in price. Looking at price alone can get you in hot water because cheaper usually means made of cheaper material so consider price alongside the other factors in this list. Finally, if you are working on a budget make sure you are only buying one that you need. If you are lifting something that is 3 tons but you buy a 20-ton capacity product you may be wasting money. Consider how heavy of an item you are lifting and only buy within the range. Q: What are they used for? As discussed previously in this article, these lifts have a wide range of uses including lifting vehicles and structures. They have specific weight capacities and the press mechanism tends to have a specific surface used to lift items. It’s important to know the surface you are lifting can be done so with the jacks press surface. In order to find out this information, you can read the information section of the site you are buying the product from or the box. Either place will typically tell you what it’s meant to lift. Q: What is bottle jack oil? Lift oil can represent two things. One is the oil that is used IN the product for the purpose of pressure for the hydraulic function. The other usage is a lubricating oil that is used in around the moving mechanisms of the lift to keep the metal from scraping against itself causing wear and tear of the device. Keeping the lift full with adequate oil levels (for the purpose of hydraulic function) will keep it working at full capacity and keeping the moving mechanisms oiled will help preserve the life of it. Needless to say, it’s important to oil your lift appropriately. Q: How do I add oil? First you need to prep your work area. If you want to avoid any possible messes from oil spills, we suggest laying some rags down and then setting the lift down in an upright position. Find the oil filler hole. This is typically located near the top of the reservoir. The plug is usually rubber and will pop off easily with a screwdriver. Set the plug aside (don’t lose this!). This is the part where you fill the reservoir with the oil. Be sure not to overfill as this will cause a hydraulic lock and your lift will not work if this happens. You should be filling the reservoir with oil until the liquid is just at the bottom of the fill hole. Pop that rubber stopper back in. This is an important step. Without the plug you are going to experience leakage and you definitely want to avoid a big mess like that. Try to keep the level of oil in your lift at an optimum level. You will notice a definite decrease in performance when your product is running low on oil, though, so running your product on empty won’t happen. Yes, if they are used within their weight limits and used on what they are supposed to be used on, they are safe. It’s also important to use the device as it’s meant to be used. Some can function sideways and upside down, the instruction manual of the device will tell you how it can be used. Once again, it’s important that these lifts are used for their intended usage. When used as per the guidelines they are safe. Another item to consider when using a lift is to work with it on a flat, solid surface. Using it on an inclined or declined surface (like a driveway) can cause it to tip over especially if it’s a taller option. Using a lift on a soft surface can lead to the lift sinking into the ground, also causing instability of the device. If there is no other option than to use the device on a slanted surface consider using tire blockers (like pieces of wood wedged tightly under tires) in order to stop the vehicle from rolling. If you have to use the device on soft ground consider using a larger flat board (to increase surface area) under the product itself to stop it from sinking. Note: even if working on solid ground, when jacking up a vehicle, securing the vehicle is always wise. Because you are typically lifting up one part of the vehicle, the tires not being lifted should always be secured with some kind of blocker to avoid roll-risk. Q: Can they be used on their side? They can be. The lift needs to have proper function to do so, though. This information will be listed in the instruction manual or on the box. When using the lift on it’s side make sure that the device is secure before using the press function for safety. Q: What is the maximum lifting capacity? It ranges but the biggest we’ve seen is 50-tons, this equates to about 100,000 pounds. They can also be as small as only being able to lift 3-tons (6000 pounds). This information is always listed on the box and the instruction manual. It’s important to know what you are lifting and it’s weight before using a lift. Q: What is the minimum/maximum lifting range ? This depends on a couple factors. The overall lifting height can range depending on the current (un-extended) height of the lift. There are “stubby” jacks that tend to be shorter and fatter in size but can lift a fair bit. There are also much taller options that are meant for taller vehicles. Typically the minimum height is about 5 inches and the maximum can go up to 30 inches. Remember to measure the current height of the item you are lifting to ensure that the lift can fit standing un-extended before purchasing your item. Also, know how height the item you are wanting to lift needs to and can go too. Q: How do these even work? This type of hydraulic lift, in the simplest explanation, relies on pressure to extend the press out. When the lever is lifted upwards, the lift draws liquid (usually oil) up into what is called a pump cylinder. When the level is pressed down it draws the liquid into a secondary cylinder. When this happens it makes the piston rise due to the pressure. As this process is continued the piston continues to rise thus lifting the item it’s supposed to lift. Q: Do they require maintenance? Yes, as discussed above it requires oil to maintain the oil pressure in the device and it requires oil in the moving parts to keep everything lubricated and to stop the metal from grinding (causing wear and tear). It’s also helpful to keep the lift in a cool place, covered to avoid any dust build up. Dust can cause the oil to clump thereby causing more wear, unnecessary wear. Not many of these kinds of products come with covers, so a little arts and crafts session may be in order to make something that will cover it. Q: How do I know what kind I will need for the project I am working on? There are many different types of this product available on the market. In this Buying Guide, we have obviously only focused on the one kind of lift. There are numerous other options for similar products available, however. From scissor to floor to trolley and many in between, there certainly is no shortage on lifting accessories for your home garage. The difference between these lies in the job you’re need the product for as well as the weight lifting capacity you require for your project. A scissor option is inexpensive, easy to operate and doesn’t leak, but they’re limited in the amount of weight they can lift. A floor jack can typically lift your objects higher vertically than the bottle variety can as well as offer more stability. That said, they’re much heavier than other options and aren’t nearly as portable. 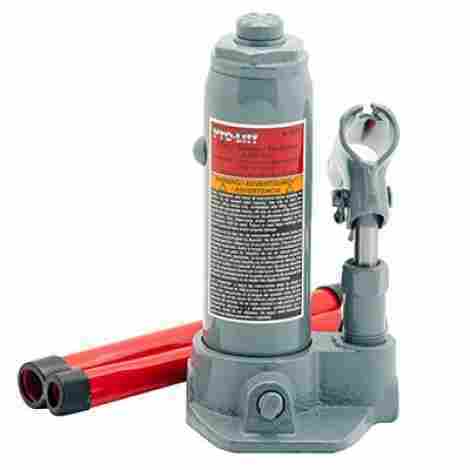 The trolley jack is a hydraulic option, working similarly to the bottle variety, and are typically used to lift vehicles. They usually come with safety features to help keep you safe while you are working underneath your vehicles. These are just a few of the different options available on the market. We recommend you do your due diligence in researching which type is best for you and your project. 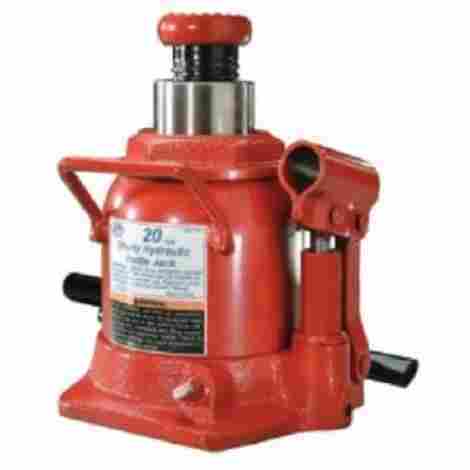 Reference – How Does a Hydraulic Jack Work?